Garnet and sterling silver hoop earrings. Stylish, elegant and a lovely twist on the plain hoop earring. The sterling silver hoop is plain, beautifully curved and set with an oval garnet gemstone. The garnet is a cabochon (uncut gemstone), polished to a smooth glossy surface. 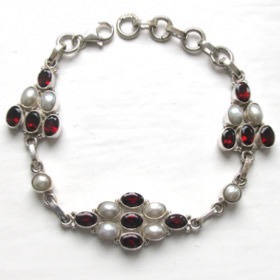 Wear with other pieces of garnet jewellery or a sterling silver necklace.